Guido Morel on his farm in La Vega, the heart of oriental vegetable production in the Dominican Republic. Guido Morel’s Chinese eggplant and Indian Bitter melon grow amid rows of vibrant yellow marigolds and sunflowers on his farm in the heart of oriental vegetable production in the Dominican Republic. Other farmers in the region know about Guido and his eggplant. The harvest he recently delivered to an exporter’s packinghouse was categorized as “gold”—in other words, blemish-free and uniform in shape. And his fellow farmers know that Guido cut his average rejection rate in half, without even a single application of insecticide. The packinghouses have heard about the eggplant, too, and Guido has been receiving requests from packinghouses to send other farmers to visit his farm—not to see his vegetables, but his flowers. They’re the key to Guido’s pesticide-free crops. At neighboring farms, growers have had to apply chemical insecticides as many as 12 times. The enemy? 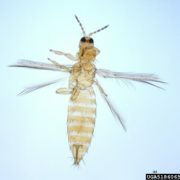 A nearly microscopic insect, Thrips palmi, which is the bane of Dominican oriental vegetable farmers. Disproportionate to their size, thrips have the ability to cause major cosmetic damage to eggplants. They are extremely difficult to control and insecticides can actually make the situation worse—the thrips hide under the eggplant’s stem cap while the insecticides kill their natural predators, resulting in population boom for thrips. Dominican exporters and authorities are alarmed about the rate of rejection by European inspectors due to thrips. Eight expensive air freight shipments of eggplant and bitter melon per week are being destroyed due to the presence of thrips. The EU requires that Dominican eggplants and bitter melon undergo a hot water wash in the packinghouse to dislodge and kill thrips, but exporters say that this hot wash reduces vegetable shelf life. It turns out that the best place to fight thrips is on their favorite turf: in the field where vegetables are grown. Photo: Stan Diffie, University of Georgia. Used under a Creative Commons license. To fight the health and environmental dangers of heavy insecticide use and the economic threat to farmers posed by thrips, Exporting Quality, a program funded by the USDA, started an integrated pest management program that debuted on Guido’s farm. The integrated approach involves companion planting, grouping a combination of plants that work in a symbiotic relationship that benefits all the vegetation. Marigold and sunflower are an attractive refuge for insects that prey on thrips. The plants also serve as a trap, since they are more attractive to the pest than the crop itself, drawing them away from the valuable vegetables. For even more protection, Exporting Quality also taught Guido to use reflective plastic mulch that reflects certain wavelengths of sunlight that repel thrips. It has the added benefit of inhibiting weeds. To adopt this type of pest management, Guido’s farm had to avoid applying preventative pesticides and wait until it was clear that pests were actually present. Exporting Quality arranged training on pest identification and determining the level of pest presence that would require an insecticide response. 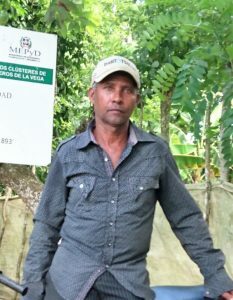 This is a big cultural shift for Dominican farmers, who are virtually besieged by sales reps from chemical companies who advocate and encourage indiscriminate spraying. Guido’s experiments with integrated pest management have been largely successful. He had a brief appearance of some potato flea beetles, his bitter melon crops remain thrips and insecticide-free. 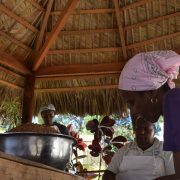 Replicating Guido’s success and introducing it to more Dominican farmers will require extensive training for farmers, packinghouse technicians, and extension agents and ensuring there is ready access to flower seeds and plastic mulch. But the survival of a $70 million per year export industry is at stake, not to mention the health of farmers and consumers. Over the next 2 years, Exporting Quality plans to expand integrated pest management to five demonstration farms and promote integrated pest management technology to all of the 46 oriental vegetable packinghouses in La Vega, offering training to their technicians and associated farmers. As for Guido, he’s ready for next level integrated pest control—he plans to introduce beneficial insects to his farm. These insects, who feed on thrips and other problem pests, will only thrive if Guido continues to refrain from most pesticides and if he can limit the amount of pesticide drift from neighboring farms. “In all my 20 years that I’ve been growing eggplant, I never thought. . .I would have to spray almost no insecticide,” said Guido of this new technology. Exporting Quality is implemented by IESC, togther with Florida A&M University, the Global Cold Chain Alliance, and the Center for Agriculture and Forestry Development. The USDA-funded program runs through 2019.